Good morning, and welcome back to Ridin Out the Recession. We hope everyone is doing just fine. AP writes the column Evolution/Revolution that you see on our site every so often. AP is 91 and will be 92 this coming month, I believe. What a character this guy is! AP and I met through a mutual friend, and began corresponding back and forth. This went on for over a year and a half. We’ve been going to meet for a while now, but something always came up, whether it be on our end or his. It seems the older you get…the more Doctor appointments you have. Imagine that! We took down a meatloaf, some barbequed chicken, cream 40 peas, rice, cornbread, squash pickles, and Mom’s chili sauce. Heide had baked a brisket, smothered with onions, and bread. Good Lord did we have a good lunch. Heide, who’s German, had a pack of sausage that is made by a German butcher in NYC. Flip brings it down, or has it shipped to them, and she gave me a few links to try out. Heide says it’s very good sausage, and I can’t wait to try it out! Then, once we got home I saw something wrapped up in foil, and asked Deb what it was? 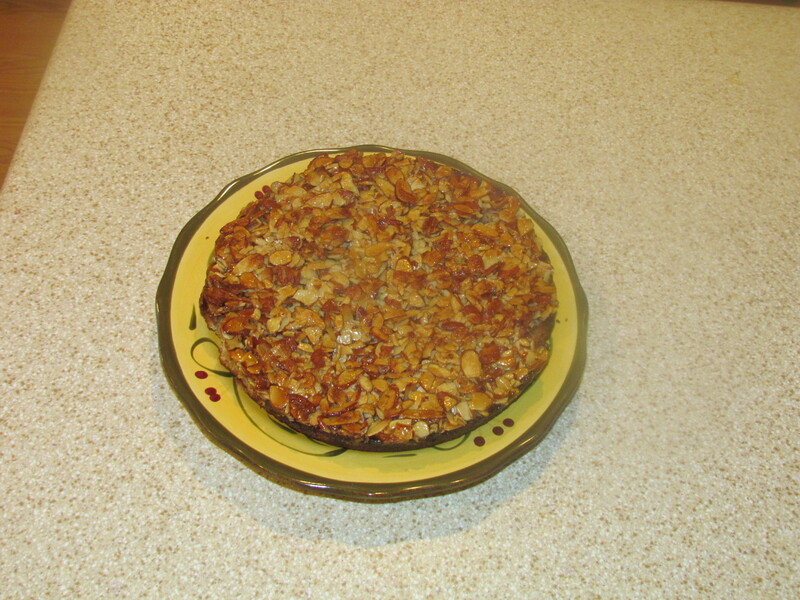 She told me to go ahead and open it up, and good gracious, what a surprise…an almond cake! I told ole Deb to stay the heck out of it cause she doesn’t need the sugar, and that I’d take it upon myself to get that dern thing outta the house…just give me a day or two!! I’d never seen an almond cake before, and what a good looking cake as far as presentation goes. If you were raised in a barn like I was, and haven’t seen one before, they are really good looking cakes. I tasted it last night and told ole Deb, “Don’t worry honey, you ain’t missin a thing. It don’t taste worth a flip!” LOL! To be honest with you guys today, I REALLY don’t think she believed me, but two-three days after it’s gone…she’ll forget all about it anyway! But you can see my predicament, right? It’s like a “Catch 22.” I know Deb doesn’t really need it at the moment, BUT, in the same breath, I wouldn’t want to hurt Heide’s feelings for the world, by not eating it. So, I’m gonna just “step up,” “be a man,” keep Deb out of it, and FORCE myself to eat the dern thing! I see NO other way of doing it! Anyway, being Deb doesn’t speak, or understand German, I have a message for Heide this morning in regards to her cake. Anyway we drove down yesterday to finally meet them, and what a great time we had. We took our son, Red, with us. AP said it was a pleasant surprise to meet Red as well, but I told him the reason for bringing him was simply that it was cheaper to feed him if we brought him with us, than to leave him at our house and him staying in my dern refrigerator the whole time Deb and I were gone! Red interprets his “watching our home” for us while we’re gone as food…FREE FOOD, and plenty of it. That boy can run through a plate of leftovers like a dern circle saw, and “the free of charge” tag that evidently Red envisions stuck on the outside of our fridge simply means…come and get it!! So, while Deb, Red and I headed South, Dale watched the place for us. The reasoning…Dale’s a lot smaller fellow than Red, so I figure he can’t possibly eat as much. WRONG! We pull up at the house, get out, and hear something making one heck of a racket…it was Dale. That joker was outside on the porch, laid out across the picnick table, and just a moanin and groanin to beat the band. He just continues moanin, and groanin. While this is taking place I head off to the kitchen, AND my refrigerator. I open the fridge, look in, and dad-gum, the dern thing looked like it was a bank…and the James Gang had just left out! In other words…the vault was empty! I was headed out the door like a late freight! Deb says to cool my jets, and it was alright for Dale to get something to eat while we were gone. I told her that yes, I agree that it was fine for Dale to get something to eat while we were gone…no sweat. BUT, to eat the fridge slap out of food was carrying his eatin to another level…or extreme! I just told her that I guess this was true, BUT the refrigerator is slap on empty…not even pickle juice is left in any jars. It’s gone…it’s all gone. Then it hit Deb! She asked, “You don’t mean that the bowl of fruit salad I left to eat tonight is gone too…is it?” I just nodded my head that yes, it too was…history! Good Lord, you couldn’t have poured hot water on Deb and made her any madder…her fruit salad was part of “that knot” that was in Dale’s belly, and she was livid! She jumped up on that dern table and grabbed Dale right by the throat with both hands, and went to squeezin the life outta that guy. I truly believe that if Red and I hadn’t been right there to grab her, ole Dale would’ve gotten hurt…bad! I also believe that if Dale stays here again, and is starving slap to death…he won’t be eating any more fruit salad…period! Red took Deb inside to cool off, and Dale looked over and said, “Dub, I had no idea that Deb was so dern strong.” I just told Dale that she was a tiger and to remember that, and I think he will. A married couple was in a terrible accident where the man’s face was severely burned. The doctor told the husband that they couldn’t graft any skin from his body because he was too skinny. So the wife offered to donate some of her own skin. However, the only skin on her body that the doctor felt was suitable would have to come from her buttocks. The husband and wife agreed that they would tell no one about where the skin came from, and they requested that the doctor also honor their secret. After all, this was a very delicate matter. After the surgery was completed, everyone was astounded at the man’s new face. He looked more handsome than he ever had before! All his friends and relatives just went on and on about his youthful beauty! One day, he was alone with his wife, and he was overcome with emotion at her sacrifice. He said, ‘Dear, I just want to thank you for everything you did for me. How can I possibly repay you? On another note this morning, I have to touch base on the “Game of the Century” once more. For all you college football fans you know this as the LSU-Bama matchup that was just played last weekend. Well, a couple of our friends that are from Alabama, and are really good sports too, by the way, sent me an e-mail after the game. When I got this I just cracked up, and I think you guys will like it too. It just shows that although we all root and pull for our favorite teams, we can still step back, and find humor, even in a loss. We wish you guy’s the best in all you do, and God Bless you and yours! Deb says to keep a smile on your face, and one in your heart! 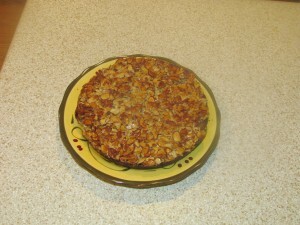 This entry was posted in Ridin out the Recession and tagged baking, funny stories, humor, humorous stories. Bookmark the permalink.